N'kisi (pronounced ‘‘in-key-see’’) is a captive bred eight or nine-year-old hand raised African Grey Parrot whose owner, Aimée Morgana, thinks uses language. She doesn't think he just sounds out words. She thinks he communicates with her in language, which would in effect make N'kisi a rational parrot. For example, N'kisi utters "pretty smell medicine" when he wants to describe the aromatherapy oils that Aimée uses. * Furthermore, Aimée says her parrot has a fine sense of humor and knows how to laugh. Imagine having conversations with a humorous parrot. Think of all the things you could talk and joke about, besides aromatherapy. You could discuss the fame that would come to anyone who had a parrot that can think and converse in intelligent discourse, like pretty smell medicine and look at my pretty naked body. * And when some nasty skeptic makes fun of you, the two of you can joke about it. We were doing demos at the Media Lab [at MIT] for our corporate sponsors; we had a very small amount of time scheduled and the visitors wanted to see Alex work. So we put a number of differently colored letters on the tray that we use, put the tray in front of Alex, and asked, "Alex, what sound is blue?" He answers, "Ssss." It was an "s", so we say "Good birdie" and he replies, "Want a nut." I never claim that Alex has full-blown language; I never would. I'm not going to be able to put Alex on a "T" stand and have you interview him the way you interview me. So, whereas you or I might say "give me the nut or this interview is over" were we parrots with intentionality and language, the parrot's movements and sounds have to be less direct and more complex, so that they have to be interpreted for us by Pepperberg. In her view, Alex is "clearly getting more frustrated" and his frustration culminates with a "very slitty-eyed" expression. But this is Pepperberg's interpretation, as is her hearing the bird sound out the letters of the word 'nut'. It could have been a stutter for all we know, but Pepperberg is facilitating Alex's communication by telling us what she hears. The final paragraph indicates that Pepperberg is having a hard time drawing the line between imagining what a parrot might be thinking and projecting those thoughts into the parrot's movements and sounds. She's also having a hard time getting grant money (NIH turned her down), so she started her own private foundation, the Alex Foundation. When news of N'kisi broke on the pages of BBC online, there was no mention in the article by Alex Kirby of the parrot having conversations with people other than Aimée Morgana. (The story was originally told in USA Today in the February 12, 2001, edition.) Despite the headline "Parrot's oratory stuns scientists," there was no evidence given that the parrot had stunned anyone during a conversation. It seems that Aimée is to her parrot what the facilitator is to her client in facilitated communication, except that the parrot is actually providing data to interpret and is more like clever Hans, the horse that responded to unconscious movements of his master, than a disabled human who may not be providing any content or direction at all to the facilitator. 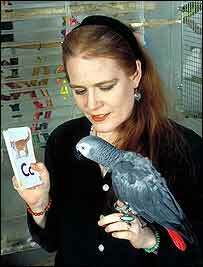 It is Aimée who gives intentionality to the parrot's sounds. She is the one who attributes 'laughter' to his shrieks and conscious awareness to his responses, though those responses could be due to any one of many stimuli, consciously or unconsciously provided by Aimée or items in the immediate environment. Nevertheless, Dr. Jane Goodall, who studies chimpanzees, met N'kisi and said that he provides an "outstanding example of interspecies communication." There is some evidence, however, that much of the work with language-using primates also mistakes subjective validation by scientists for complex linguistic abilities of their animal subjects (Wallman 1992). Kirby doesn't provide any details about the experiment, so a reader might misinterpret this claim as implying that this parrot did about twice as well as people did in the ganzfeld telepathy experiments. In those experiments, subjects in separate rooms were monitored as one tried to telepathically send information from a picture or video to the other. Typically, there was a 20% chance of guessing what the item was but results as high as 38% were reported in some meta-analyses. If the parrot scored three times better than chance, then he would have gotten 60% correct. The odds of a parrot randomly blurting out words that match up 60% of the time with pictures being looked at simultaneously in another room are so high that there is virtually no way that this could happen by chance. However, as you might suspect, Kirby's claim is a bit misleading. The full text of Sheldrake's study published in the peer reviewed Journal of Scientific Exploration is available online. The title of the paper would send most journal editors to their grave, killed by laughter: "Testing a Language-Using Parrot for Telepathy." Fortunately for Sheldrake and his associates there will always be a sympathetic editor for another story like that of J. B. Rhine and the telepathic horse, "Lady Wonder." At least Sheldrake's protocols show some measure of sophistication, unlike Rhine's. Even so, as the editor at the Journal of Scientific Exploration commented: "once again, we have suggestive results, a level of statistical significance that is less than compelling, and the devout wish that further work with refined protocols will ensue. "* So, we'll just have to wait and see whether further study of N'kisi supports the telepathic hypothesis. Anyway, here is how Sheldrake set up the experiment. He first compiled a list of 30 words from the bird's vocabulary that "could be represented by visual images." A package of 167 photos from a stock supplier was used for the test. Since only 20 of the photos corresponded to words on the list, the word list was reduced to 20. The word 'camera' was removed from the list because 'N’kisi "used it so frequently to comment on the cameras used in the tests themselves." Thus, they were left with 19 words. During the tests, N’kisi remained in his cage in Aimée’s apartment in Manhattan, New York. There was no one in the room with him. Meanwhile, Aimée went to a separate enclosed room on a different floor. N’kisi could not see or hear her, and in any case, Aimée said nothing, as confirmed by the audio track recorded on the camera that filmed her continuously. The distance between Aimée and N’kisi was about 55 feet. Aimée could hear N’kisi through a wireless baby monitor, which she used to gain ‘‘feedback’’ to help her to adjust her mental state as image sender. However, sixty of the trials were discarded because in those trials N'kisi either was silent or uttered things that were not key words, i.e., showed no signs of telepathy. A few other trials were discarded because the transcribers did not agree on what N'kisi said. In short, Sheldrake's statistical conclusions are based on the results of 71 of the trials. I'll let the reader decide whether it was proper to omit 40% of the data because the parrot didn't utter a word on the key word list during those trials. Some might argue that those sessions should be counted as misses and that by ignoring so much data where the parrot clearly did not indicate any sign of telepathy is strong evidence that Sheldrake was more interested in confirming his biases than in getting at the truth. N'kisi's misses were listed at 94. Ten of the 23 hits were on the picture that corresponded to the word 'flower', which N'kisi uttered 23 times during the trials. The flower image, selected randomly, was used in 17 trials. The image corresponding to water was used in 10 of the trials. The bird said 'water' in twelve trials and got 2 hits. It seems oddly biased that almost one-third of the images and more than half the hits came from just 2 of the 19 pictures. One of the peer reviewers thought that the fact that the flower word and picture played so heavy a role in the outcome that the paper's results were distorted and that the paper should not be published. The other reviewer accepted Sheldrake's observation that even if you throw out the flower data, you still get some sort of statistical significance. This may be true. However, since the bird allegedly had a vocabulary of some 950 words at the time of the test, omitting sessions where the bird said nothing or said something not on the key list, is unjustifiable. Furthermore, there is no evidence that it is reasonable to assume that when the parrot is by itself uttering words that it is trying to communicate telepathically with Morgana. Or are we to accept Sheldrake's assumption that the parrot turns his telepathic interest off and on, and it was on only when he uttered a word on the key list? That assumption is no more valid that Morgana's belief that the telepathy doesn't work as well when she makes an effort to send a telepathic message to her parrot. In any case, I wonder why Sheldrake didn't do a baseline study, where the parrot was videotaped for two-minutes at a time while Morgana was taking an aromatherapy bath or meditating or doing something unrelated to the key word pictures. Had he made several hundred such clips, he could then have randomly selected 71 and compared them to the 71 clips he used for his analysis. If there was no significant difference between the randomly selected clips and the ones that emerged during the experiment, then the telepathy hypothesis would not be supported. On the other hand, if he found a robust statistically significant difference, then the telepathy hypothesis would be supported. I suggest he do something along these lines when he attempts to replicate his parrot telepathy test. He calculated 51 hits and 126 misses when repetitions were included. I'm not going to bother with any more detail because by now the overall picture should be clear. Once the statisticians went to work on the data, they were able to provide support for the claim that the data were consistent with the telepathic hypothesis. But nowhere in Sheldrake's paper can I find a claim that the parrot did three times better than expected by chance. In any case, I have to agree with the editor who published Sheldrake's parrot paper: the results have a statistical significance that is less than compelling. However, unlike that editor, my devout wish is that when such studies as these are published in the future, responsible journalists continue to ignore them and recognize them for the rubbish they are. On the other hand, if you happen to think your parrot is psychic, drop Dr. Sheldrake a line. He's set up a page just for you. Sheldrake has responded to this article. His comments and my responses are posted here. See related entries on apophenia, clever Hans phenomenon, facilitated communication, pareidolia, reverse speech, and "A Short History of Psi Research" by Robert Todd Carroll. Sheldrake, Rupert and Aimée Morgana. (2003). Testing a Language-Using Parrot for Telepathy. Journal of Scientific Exploration, Vol. 17, No. 4, pp. 601–616. Wallman, Joel. (1992). Aping Language. Cambridge University Press. Irene Pepperberg, "That Damn Bird"
Grey parrots use reasoning where monkeys and dogs can’t "Christian Schloegl and his team at the University of Vienna, let six parrots choose between two containers, one containing a nut. Both containers were shaken, one eliciting a rattling sound and the other nothing. The parrots preferred the container that rattled, even if only the empty container was shaken....Thus, grey parrots seem to possess ape-like reasoning skills...."